It’s been years since my cats had fleas, so I was surprised to learn that flea allergy dermatitis in cats is on the rise. According to Banfield Pet Hospitals’ 2018 State of Pet Health Report, there’s been an astonishing 67 percent increase in flea allergy dermatitis in cats since 2008. In 2017, 170 of every 10,000 cats seen at Banfield hospitals had the allergic reaction to fleas. That doesn’t seem like a lot of cats until you think about the stats from 2008. Then, just 102 cats in every 10,000 developed flea allergy dermatitis. Flea allergy dermatitis can make cats absolutely miserable. And some cats are so sensitive, just one bite can cause the allergic reaction. Emi Saito, Banfield’s senior manager of veterinary research programs, suggests that climate change could be at least part of the reason vets are seeing more flea allergy dermatitis in cats. One of the best ways to keep your cats from getting fleas is to give them a healthy wet food diet. 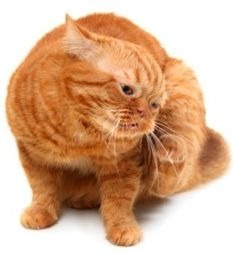 Fleas prefer old, debilitated cats and don’t have much interest in the healthy ones. Add 1/2 teaspoon of brewer’s yeast to your cat’s wet food. Rub the juice from a freshly squeezed lemon or orange on your cat’s fur. Use fresh fruit, not essential oils, which can be toxic to cats. And beware: Many cats hate the smell of citrus. Put some juice on a leg to see how your cat reacts to this new scent before doing the whole cat.